Democrats retained control of the House, captured the Senate, and ramped up their efforts to undercut Reconstruction legislation protecting African-American voting rights in the 46th Congress (1879–1881). Congress continued to challenge President Rutherford B. Hayes by attaching “riders”—substantive amendments—to Army appropriations bills prohibiting federal funding from being used to protect voting places in the former Confederacy. Democrats tried this tactic seven times—and Hayes vetoed each attempt—before Congress abandoned its efforts. The 46th Congress convened in a special, early session to address unfinished military appropriations bills that threatened a federal government shutdown. 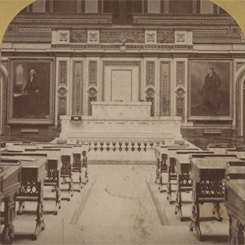 The second session of the 46th Congress (1879–1881) convened. 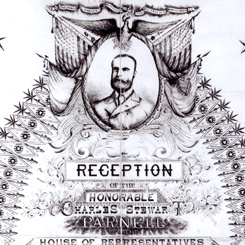 Irish Parliament Member Charles Stewart Parnell addressed the House of Representatives concerning the plight of Ireland.